Among the plethora of trends and themes that have emerged from the fall 2013 collections thus far, the most welcome and sobering, is what can best be described as a full blown movement on the part of many designers to really take into consideration the sartorial needs of the modern woman, and address them. While there are always some amazing pieces and concepts presented on the runway, before most of them can be relatable and wearable, they need to be watered or filtered down quite a bit beforehand. Unless of course, the prospective customer is Anna Della Russo, who is known to buy complete head to toe designer pieces each season, and wears them exactly as they had been shown on the runway. But with all due respect, Anna is not living a real life. She is living in a fantasy world, as opposed to the rest of us. In the last few days, many of the best pieces that have walked down the runways, have mimicked the clothes worn by those I consider to be the best dressed during the course of fashion week. They're the ones who have adapted a look predicated on unfussy, clean lined sportswear, and took into account the challenging weather conditions, and duly dressed for them. The effect is cozy, comfortable, natural, unforced, not fashion victimy, yet still pulled together. Among the pivotal pieces in their wardrobes: gutsy outerwear with a utilitarian feeling; classic, clean lined cloth coats with eased up shapes and proportions (and often, longer lengths); perfect tailored blazers; smart fur trims; great gutsy knitwear; tall boots with sensible chunky heels so that walking is not impossible; the return to real pants (not jeggings); and the reliance on neutral shades that work together and never lose their appeal: black, gray, olive, navy, camel, ivory, white. Coincidentally, what I have just described also sums up the components of Olivier Theyskens' terrific collection for Theory, which was shown at the cavernous Skylight Studios at Moynihan Station, at noon yesterday. The show was well attended, with world class retailers and editors from all the major American and European magazines. And it's obvious why. 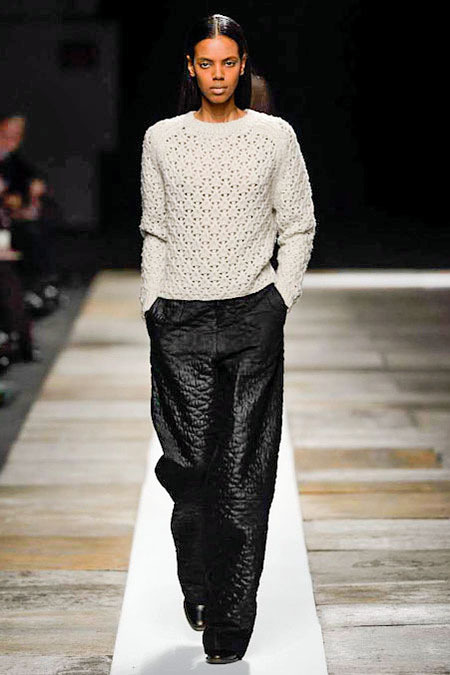 Olivier has really come into his own as head of design for this popular and well priced label and he has a following. I really loved it.What was so great about this collection, is that it was smart and chic and really ageless (it didn't look young and it didn't look old). Sure, there were shorts and short hemlines that are better left for the young with good legs, but there were other options including longer lengths and a variety of great looking trousers. 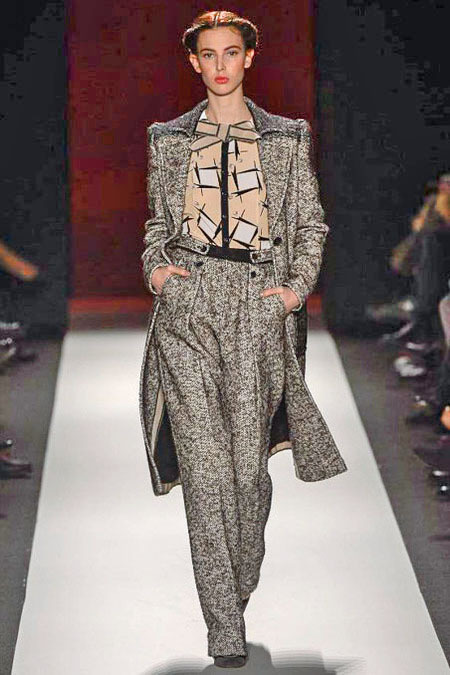 It was perfect in every way (from the neutral color palette, to the gutsy fabrics, eased up shapes, interesting play of proportions, believable layering, and the un contrived way it was all put together). The show was tightly edited with a real point of view, but there was still a lot of variety. The first outfit out, a slightly out-sized man tailored blazer in camel wool worn over a short black leather skirt, black leather gloves, and tall black leather boots, set the tone and spoke volumes. What followed were a number of great tailored blazers (in black, navy, subtle banker's gray pinstripes, etc. ); great coats and architectural outerwear; cozy, textural knitwear; sculptural dresses both elongated and short, some with curved, uneven hems; quilting (used inventively for dresses, skirts, and pants); beaded pieces in rich dark jewel tones that added just the right among of texture, shimmer and shine, and mixed in perfectly with the sturdier wool pieces. I also loved the reserved, if not minimal use of accessories: there was no jewelry, no scarves or hats, only leather gloves, tall black leather boots, and pumps; both the boots and pumps featured a sturdy wedge block heel that was not too low and not too high. Urban ready for pounding the pavement, navigating the streets, the subways, etc. On the other hand, Carolina Herrera's customer, a different breed from Theysken's Theory, is most likely not doing a lot of pavement pounding, or taking the subways to and fro. Unfortunately, there was no run of show at her formal runway show at The Tents yesterday, so I can't identify the fabrics, nor can I use her words to describe the prints or the details. What I can say is that Carolina made a point of mixing it all up, sending out day and evening in no particular order, rather than beginning with day and segueing into evening, as is usually the case (I'm sure that was making a statement of some sort). Actually, she opened the show with a cap sleeved tie neck floor length evening dress in an abstract geometric print, and proceeded to show everything from proper camel suits and handsome donegal tweeds (suits and coats), to printed or beaded knee length cocktail dresses, natty menswear inspired trousers and beautiful blouses, over-scaled florals, and languid evening gowns. Furs (notably sable, broadtail, and fox) and fur trims, were of course, part of the equation and in a few instances, they were used in unexpected ways. In one case, she used a geometric sheared mink inset on the front of a turtleneck sweater (that was paired with a large floral ball skirt), and in another, she combined broadtail and plaid for a fitted skirt suit. Carolina has long believed in the importance of pieces that would "look good across the table at a dinner party" (that is how she phrased it years ago). Hence, a continuing emphasis on making the shoulder, neckline, and sleeve look interesting by adding special details (there was abundance of all the aforementioned). Her overall silhouette, ultra feminine as always, was very narrow and fitted through the torso, with movement added to the hems of skirts. And her elegant and luxurious 'riffs' on that traditional, toasty warm, horizontally striped Hudson Bay blanket, (intentional or not), was a nice surprise. In this case, she changed the colors, making them more muted, and used the fabric for a fitted coat complete with dyed green fox 'belt', andil, and for a floor length fur trimmed skirt, which was shown with a simple fitted turtleneck. And in a season where heads have been covered with all sorts of hoods, Carolina's evening take (a black sequined hooded long sleeved top which was paired with a long black chiffon skirt), looked modern and young. 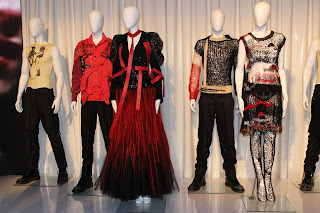 The press presentation on the upcoming exhibition examining the evolution from punk to couture was held at the ungodly hour of eight thirty at the Metropolitan Museum of Art. (I observed the crowd was sparse which I attributed to the late start of many in the fashion industry). The museum is a magnificent venue lending gravitas to the import of fashion and the Costume Institute and the speakers were highly educated and scholarly. Thomas Campbell, the director of the Metropolitan Museum of Art, spoke about punks legacy and its pervasive influence on high fashion. This self expression of art ranged from the punk motifs of cbgb to the brasseries of Paris. He then thanked Anna Wintour for heading the Costume Institute fundraising effort for sixteen years along with the sponsors and Givenchy. Andrew Bolton, the curator of the Costume Institute, then expounded on the importance of punk on all aspects of culture. He stated, "there are no other more enduring influences on high fashion than punk. Punk lives in the present and is fostered on a nihilism and a fiercely independent spirit of do it yourself." He then recounted the designers from the 70's to the present, ranging from Vivienne Westwood to McQueen and Lagerfeld, who understand the punk trend and have translated it into their own design such as the obscene t-shirts Vivienne Westwood produced to the classic Chanel couture suits of Lagerfeld. The impact of punk on all aspects of our lives is far reaching from the shoes and makeup we wear to the decor of houses we live in and this influence is so prominent in modern day culture it necessitates great exploration as the Costume Institute is undertaking. At the conclusion of the event Anna Wintour, Laura Santo Domingo, Hamish Bowles, and the Museum directors stood up for a group photo showing their dedication to the Costume Institute and its goals. The Avalon is a tough, durable sports watch (it’s designed for female divers) with an elegant look. 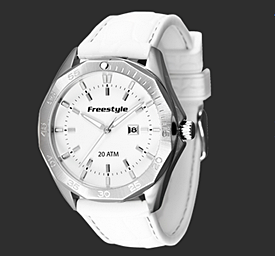 It has a crocodile embossed band and is water resistant to 200 meters.